Nothing warms you up faster than a steaming cup of hot cider. The aroma fills the house and just says “Christmas.” Give this drink to the kids on a cold winter morning while you’re sipping coffee or after a day of sledding. It’s also perfect to offer guests as they arrive for a Christmas party. Make sure to use cider and not apple juice in this recipe; cider has a much richer flavor and more body. Read labels and try cider from a local orchard. A green market or farmer’s market is a good place to find cider in late fall. You can buy half-gallons, remove an inch or two off the top to allow for expansion upon freezing, and freeze them right in their own plastic containers. Take them out and defrost to enjoy at Christmas time. Defrost completely and shake before serving. 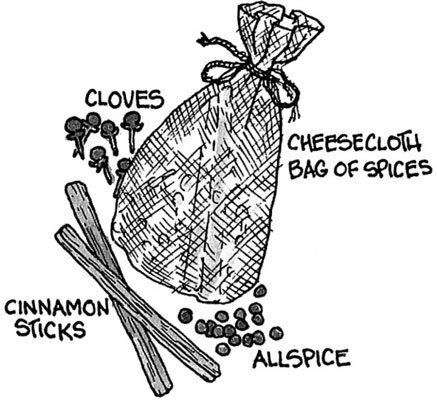 Place the allspice berries, cloves, and cinnamon sticks in a piece of cheesecloth and tie with string to make an enclosed bag. If you don’t have cheesecloth, simply place the allspice, cloves, and cinnamon sticks directly in the pot of cider along with the orange slices and strain before serving. Bagging spices for mulled cider. Place the cider in a large nonreactive pot and add the spice bag and orange slices. Bring to a boil over medium heat, reduce the heat to low, and simmer gently for 20 minutes to develop the flavors. Taste and add sugar, if desired. Pour into heatproof glasses or mugs. Per serving: Calories 127; Fat 0g (Saturated Fat 0g); Cholesterol 0mg; Sodium 25mg; Carbohydrate 32g (Dietary Fiber 0g); Protein 0g. For the adults in the crowd, add a couple of tablespoons of apple brandy to each mug. For a party, stud a few lady apples with cloves and float them in your punch bowl for a decorative look. You could also use cinnamon sticks as stirrers.